When it comes to pregnancy and delivering a baby, many women chose their medical provider based on friends reviews or the proximity of the hospital. Sadly, doctors aren’t usually questioned much because of the trust we all have for doctors. And because we tend to presume that doctors know better than anyone, questioning their practice is not necessary. While most doctors know what they are doing, but it doesn’t automatically mean that they are good at everything when it comes to delivering a baby. World Health Organization keeps stressing that an increased rate of C-sections doesn’t provide any benefits for mother and a baby. If you chose a midwife to be your healthcare provider during pregnancy and delivering a baby, you have some kind of reassurance that natural birthing approach is expected. But when your provider is an OB-GYN, you might want to talk to him more in details to find his own birthing philosophy. 1. What is a doctor’s personal c-section rate? Although, it may be hard to obtain this information, but knowing the approximate ratio will help you to determine whether a chosen doctor is right for you. Clearly, the lower rate – the better. Many doctors consider C-section to be a better and safer option for giving birth. Because during C-section doctors know what to do and in just 20 min the baby is being born. Unlike when the woman delivering a baby naturally, doctors can’t control the situation much and that’s what intimidate them. 2. Can you move and walk during labor? Many US hospitals still use continues electronic fetal monitoring (EFM) during labor and delivery. Which means you’ll have a Doppler ultrasound machine attached to your belly for measuring the baby’s heart rate and woman’s contractions. When you have a continues EFM, you’ll have to be lying on your back all the time. This may give you more painful contractions, therefore increasing a chance for an epidural. If you set your mind on having a natural birth, it’s important to have a freedom to move and walk around during labor. It is good for two reasons. First – it will help you to cope with labor contractions more effectively. Second – by moving you’ll help the baby to descend into a birth canal a little faster, thus shortening the labor. Many hospitals who allow to move during birth, will still require EFM for the first 20 minutes upon admission. Make sure, you let your doctor know that you plan to walk after those 20 minutes are over. If you want to know natural methods to cope with a discomfort during birth, take a look at these proven ways to ease labor pain, which helped me to have an epidural-free labor. 3. Can you deliver a baby in any position? Nowadays, most OB-GYNs in the USA prefer when a mother lies on her back during pushing stage of labor. And no wonder. This gives a doctor a clear picture of what’s going on without the need to bend, tilt or squat. However, this practice gives an advantage to doctors only. The woman is not benefiting from lying on her back. If you want to make the pushing stage more effective, get off your back. Pushing in upright position has more advantages than being on your back. First – the gravity helps to push the baby out faster. Second – upright position helps to alleviate pressure from the mother’s aorta, thus not preventing an oxygen supply to a baby. When it comes to choosing the right position for delivering a baby, there are many options available. You can try squatting, kneeling, birthing stool, sitting, side-lying. Ask your doctor what positions are acceptable in his practice. 4. What is a doctor’s approach to episiotomy? Here’s the truth. Doctors love episiotomy. Despite the recommendation of American Congress of Obstetricians and Gynecologists to avoid routine episiotimies without medical reasons, doctors still continue to perform this procedure. And doctors love doing episiotomy for 2 reasons. First – it speeds up the labor process. Second – it’s easier for them to make stitches on a clear incision rather than on a natural tear. But, would you care what is easier for a doctor or what’s better for you? The answer is obvious. Episiotomy or perineum cut has its own disadvantages. For many years, this procedure was considered helpful for preventing more extensive vaginal tears during labor. But doctors who believe that clear incision will heal better than a spontaneous tear are guided by an outdated information. When episiotomy is performed, the incision is often more extensive which may result in a longer healing process. When a birthing mother has a natural, spontaneous tear, especially if it’s a first degree tear, no stitches are usually required and it will heal on its own. 5. How long a mother is allowed to birth on her own before a doctor decides to induce her? Normally, if there’s no medical concern, after your water’s broke, a mother is allowed to continue birthing on her own within 24 hours. After that period, your doctor or midwife will probably suggest an induction. Since there might be a possibility of infection. Doctors simply don’t like to give a mother so much time for delivering a baby. They prefer to start inducing her earlier or sending for C-section to speed things up. It is especially true before major holidays. If your due date happens to be on Christmas, Thanksgiving, or any other holiday, it is less likely that a doctor will spend this time in the hospital. Make sure to ask your OB-GYN/midwife this question, especially if you’re due on holidays. If you’re planning a natural birth, here’s a Birth Plan that I used to deliver my daughter. You can print it out and talk it over with your OB-GYN/midwife. And if you’re taking prenatal vitamins, make sure they contain the right ingredients to give your baby the best possible start. You can read my full post about it, here. When a women’s role in delivering a baby is diminished, it opens up a window to a whole lot of interventions that might lead to serious complications. Therefore, it is very important to take a careful and informed approach in choosing your healthcare provider during pregnancy and birth. 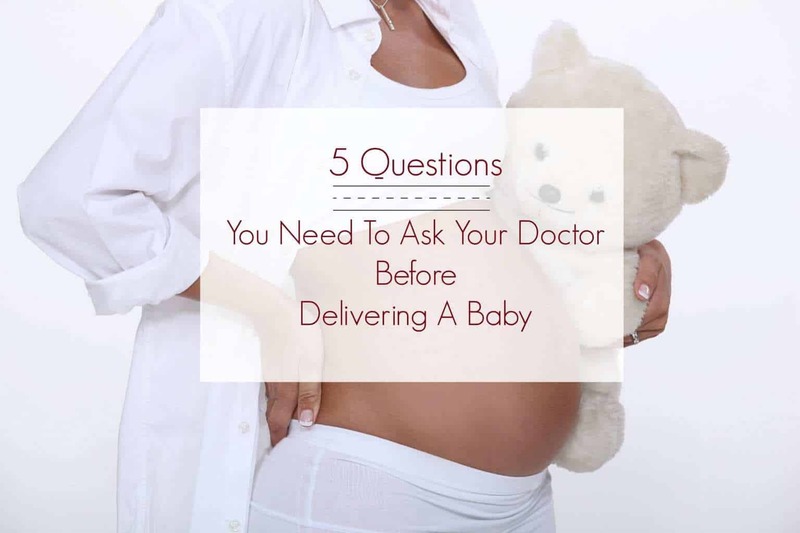 What do you think are the other questions that need to be addressed before delivering a baby? Before my wife has our baby, it is a good idea to ask questions. As you said here, I would probably ask the doctor all of the questions you have listed here. You can’t be too careful when it comes to babies and the delivery process. That’s great that you found a good doctor who is capable to accomodate your requests and who is not going to schedule an induction without necessity. Doctors’ priorities should be the comfort of their patients. I’m glad you have good doctors in Canada. I’ve also heard good things about them. I’m also happy that there are more and more midwifes who keep a holistic approach to a women’s health. I’m glad to say that here in New Zealand it is pretty standard to have a midwife as your lead maternity carer. Most of them have a good understanding of and actively encourage most of the suggestions you make here. There were no doctors involved in the delivery of my baby, but I understand that once they get involved there can be some quite heated debates between the midwife and Dr! Thanks for your comment Robyn! That’s really good that labor and delivery have a more natural approach in New Zealand. The same thing is in Europe. But unfortunately America with all its technical progress didn’t achieve much in providing the best birthing environment for mother and the baby. And most women here tend to trust doctors rather than midwifes. These are perfect! I wish I would have had this when I was pregnant!